911 Restoration Kansas City Metro is your go-to company for all the various water-related problems you may encounter in Leawood. Dealing with water damage can be a stressful and frustrating situation. Roof leaks, flooding, and storm damage need to be dealt with as soon as possible to mitigate any further damage to your home. Luckily, our water damage Leawood experts can provide you with quality water damage repair and restoration within 45 minutes of your call. When a rainstorm floods a sewer system, it can cause pressure to rise and shoot up from your toilet. When this occurs, you have a sewage backup on your hands. This kind of issue is a severe problem that needs to be dealt with quickly in order to prevent further damage to your home and to keep your family safe from the bacteria that comes with sewage water. When there’s a sewage backup within your home, it’s best to call the IICRC certified water damage Leawood specialists from 911 Restoration Kansas City Metro as soon as possible. We have the proper equipment and training in order to draw black water away from your home. 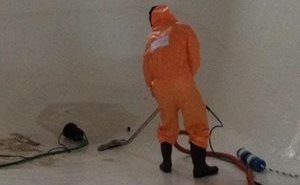 To safely work on the problem, our water damage Leawood flood removal team wears protective hazmat gear that will help us clean the area safely. For a thorough clean, we use industrial strength sewage cleaning products that can effectively rid the area of harmful bacteria while keeping the hardwood surfaces of your home safe from damage. So that the affected area is sufficiently dried, our specialized drying equipment and techniques to make sure water and moisture are removed. When sewage backups cause you problems, our water damage Leawood team knows exactly what to do to restore your home to look good as new. We’re the experts you can always to turn so your home can get a fresh start! 911 Restoration Kansas City Metro has the quality water damage repair and restoration services that your home needs a fresh start after major problems like flooding, roof leaks, or sewage backup. 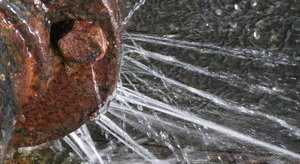 We will be dealing with all kinds of water-related issues with a timely and professional approach. We know how unexpected water damage can occur, that’s why our water damage Leawood team is available 24/7/365 to give you an immediate response to the problem whenever it occurs. We will also be prepared to assist in filing your insurance claims so you can get the most affordable price for the services your home needs. We’re the clear choice when it comes to water damage restoration. When a leak or a flood is causing major headaches, call the water damage Leawood professionals from 911 Restoration Kansas City Metro for a quality remedy to all those leaks!